One of the great joys and benefits of living at Mosaic Commons is participating in our common meals. Common meals are served in our Common House. Currently we have one or two dinners and one brunch per week, though we hope to have more soon. Members take turns signing up for cooking and/or clean-up teams. If you aren't on the cooking or clean-up team for a meal, just listen for the dinner bell and find a seat! Cooks decide on a menu and post it to our community mailing list about a week before a meal. Interested diners respond online or on a sign-up sheet in the Common House. Currently the charge for most meals is $4 (dinners) or $3 (brunches) (half that for small children). 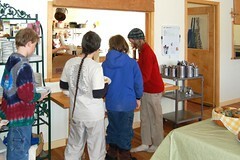 Meals are scheduled and coordinated by our meals team. At any given meal, as few as 15 folks may attend, or as many as 50! Most meals include both vegetarian (or vegan) and non-vegetarian dishes. We welcome guests at our common meals. If you'd like to visit, please contact us.